My name is Mary Kemp and I have a house in Morienne, Normandy. 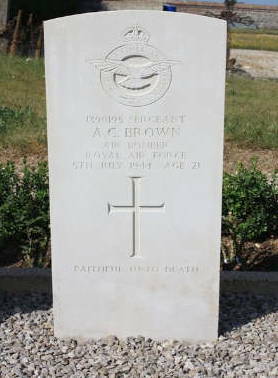 The next village to me is Ellecourt and the cemetery there has 7 commonwealth graves for the Lancaster crew that was shot down 4/5th July 1944. My grandson and I decided to do a project on this crew so that he could understand a little bit more about the history of WW2. Four of the crew are Australian and several of their relatives will be attending this commemoration. They have been easier to trace because Australia keeps very good records. On the night of 4th 5th July 1944, Bomber command sent a force of 231 Lancaster's and 15 Mosquito's to attack the V1 supply depot at Saint Leu D'Esserent. With the target area having been identified previously, the air crews mapped their route in order to miss major towns and known flak installations which they might encounter over France. What had not been foreseen was the amount of Luftwaffe fighters which had been assembled to defend the supply depot. This force would have a serious outcome with no less than 13 RAF Lancaster's being shot down over occupied territory. Many of the crews would die in their valiant effort to bring an end to the V1 reign of terror over England. The bombing raid over Saint Leu D'Esserent was planned at night with the 'bombs away' set for 01H45 am. This particular night was a clear sky with bright moonlight. The attacking force assembled over England between 23h30 and started it journey over the English Channel and the French coast.With the bomber formation now over French territory they faced the defending force of German Luftwaffe fighters. The fighters would harass the bomber crews all the way to the target and on their return journey. By no means was this a 'milk run'. The first aircraft to succumb was 463 squadron's Lancaster HK536 JO-H. It was shot down over the town of Ellecourt in the Seine-Maritime department north west of Beauvais. 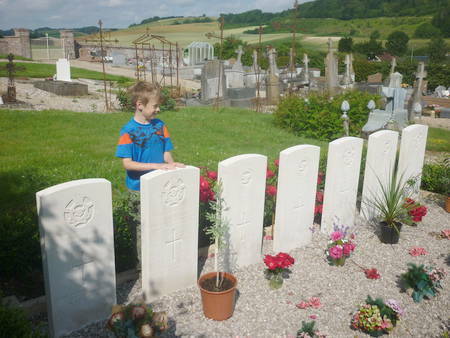 The crew of seven are all buried in the Ellecourt Communal cemetery. Four of the crew were RAAF. A claim is made by Luftwaffe fighter pilot Uffz.Grätz 3/JG301 at around 01H15. F/O A.K.Carter (RAAF), Sgt B.J.Watts, F/S R.H.Norman, Sgt A.C.Brown, F/S T.F.Maher (RAAF), F/S G.R.Whimpey (BEM RAAF), F/S G.E.Dowling. The seven graves of our fallen airmen. 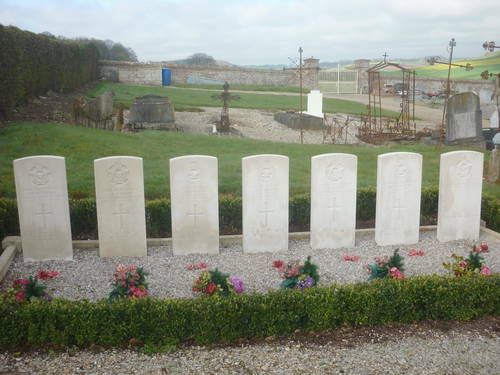 Arthur Brown's headstone is 4th from the left. 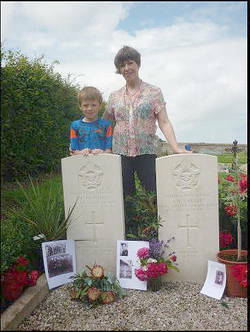 Mary Kemps grandson, George Deverall-Bartlette standing by the graves in Ellencourt. 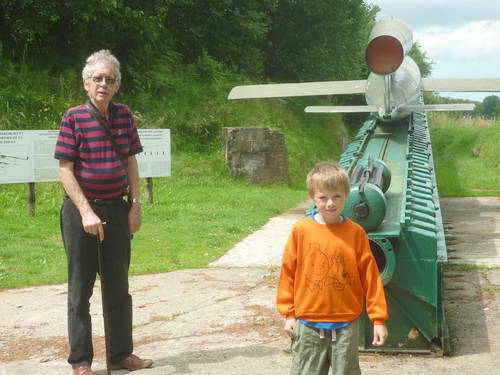 Mary Kemps late husband Jeremy standing by a V1 site in Normandy with grandson George Deverall-Bartlette. This was the site the Lancaster was intending to bomb before it met Luftwaffe enemy fire. 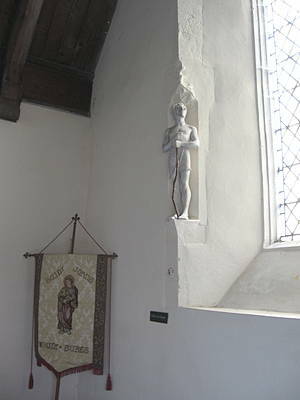 This statue of St John the Baptist was presented to Mount Bures Church (Circa 1945 to 1950) by the parents of Arthur Brown as a memorium to their sons death. 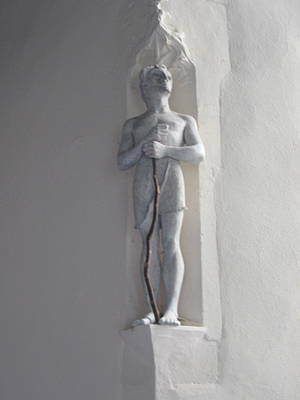 It stand beside the East Window inside the Church. 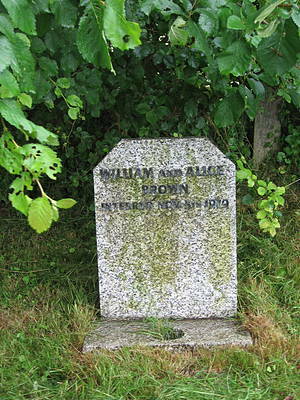 Mount Bures church statue and gravestone information, John Cowlin.